B and I were planning on having delicious, unhealthy lunch from Taco Bell. We talked ourselves out of that and decided to do something healthier. We started talking about shrimp po’boys and decided to make a healthier version. We used a lot of Old Bay so make sure you reduce the amount if you don’t like it that spicy/salty. Coat defrosted shrimp with Old Bay seasoning, bread crumbs, and pepper. Coat a pan with non-stick spray. Saute shrimp for approximately 4-5 minutes. Mix all of the ingredients together for the remoulade. Spread remoulade on the sub/hoagie roll. 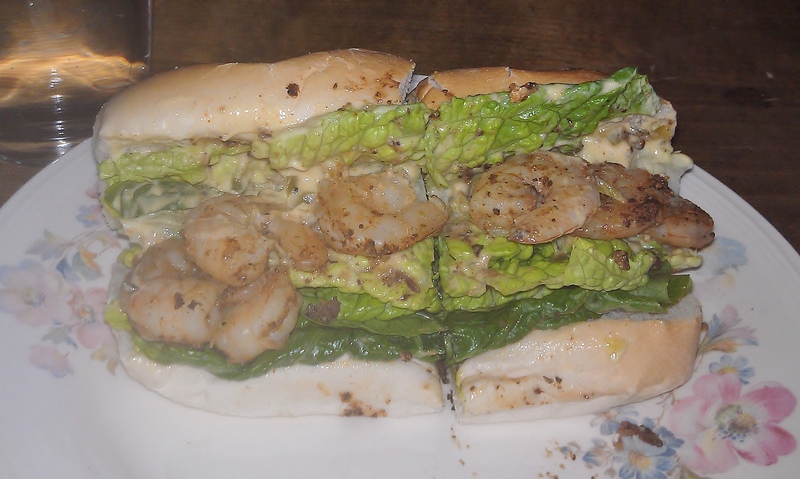 Place shrimp on roll with tomato slices and lettuce.